I recently watched an interview with former First Lady, Michelle Obama, on the TODAY Show who opened up about her experience with infertility. In the interview, Mrs. Obama shared about her miscarriage before giving birth to her daughters. And, she talked about how women keep their secrets about miscarriage. About how couples hide their pain around infertility. As I watched, I got the feeling that many women would instantly relate to what this high-profile, public figure had to say about her private life and struggle to start a family. Miscarriage is such a seemingly taboo subject among women. We all know miscarriages can and do happen. Statistically, as many as 75 percent of fertilized eggs do not go on to result in a full-term pregnancy. Yet, women still experience shame, isolation and depression as a result of having a miscarriage. After having gone through a miscarriage, women suffer from all sorts of physical and emotional pain like having the feeling of failure, guilt and having let everyone down. But, these emotions are kept silent for so many reasons. Infertility and pregnancy loss is such a broad subject in the realm of family planning, nutrition and couple’s health and hormone balance. In particular, women who have Hashimoto’s autoimmune thyroid disease have more complicated statistics related to pregnancy loss. Researchers in a 2011 study published in the British Medical Journal conducted a systematic review of 31 studies involving over 31,000 women. According to the researchers, they found thyroid antibodies increased the risk of miscarriage by 290%! Without a doubt, women with autoimmune thyroid disease face greater challenges with fertility than the general population. I have Hashimoto’s and I had three pregnancy losses. The first miscarriage was the most difficult loss emotionally (and still to this day brings tears to my eyes to remember what my husband and I went through). Before my first miscarriage, I didn’t know my disease could affect my chances for a healthy pregnancy. I didn’t know that taking synthetic thyroid hormone (Synthroid) was alone not enough to support healthy reproductive function. I didn’t know that certain nutritional deficiencies were likely at the root cause for my hormone imbalance/low progesterone that ultimately led to three losses. I also didn’t know that there were corresponding endocrine dysfunction issues. And this prevented my body from being healthy enough to carry a baby to term. The first miscarriage was definitely an eye-opening experience. It led me to research, read, and learn about the implications of thyroid health (or lack thereof) on pregnancy. And, through reading and learning, I found it important to talk about my experiences with all three miscarriages. I wanted to share with other women in hopes of helping ease the pain and loss for someone else. For me, not getting pregnant was not the issue. I was fertile. I could easily get pregnant. This is often the case with women who have Hashimoto’s disease. A woman may not know she has Hashimoto’s and may not yet be receiving medication treatment prior to pregnancy. I recommend women get their thyroid panels checked, (including antibodies) before trying to conceive. A woman may not be on the proper dosage of medication. Higher levels of thyroid hormone are needed during pregnancy. In women with normal thyroid function, the thyroid gland increases the production of thyroid hormone to meet this increased need. In hypothyroid women, this often means that the dose of Levothyroxine needs to be increased during pregnancy. Many endocrinologists advise pregnant women take a higher dose of synthetic thyroid hormone (like Synthroid) as soon as pregnancy is confirmed. Regular blood tests for TSH to ensure that the level remains normal are also highly encouraged. A woman may have hormone problems. For instance, Luteal Phase Defect, Polycystic ovary syndrome (PCOS) or Estrogen dominance due to other imbalances in her endocrine system. Hypothyroidism can decrease the absorption of progesterone by the body’s cells. And this upsets the menstrual cycle and female hormone balance. A woman may have abnormal Natural Killer (NK) cell activity. They are responsible for protecting us from bacteria, viruses and foreign bodies, and organ transplants rejections. This problem can switch on and off, so some of the women may have 1 or more normal pregnancies as well as recurrent miscarriages. A woman may have gluten intolerance or Celiac disease which can contribute to digestive problems, systemic inflammation, widespread deficiencies. This includes anemia and general autoimmune activity in the body. Pregnancy can be a factor that “turns on” celiac disease in previously non-Celiac women. Dramatic changes in the probiotic population of a woman’s intestines during pregnancy can activate gluten intolerant genes. This leads to active Celiac disease. Most doctors recommend that all women at high risk for thyroid disease should have a TSH and an estimate of free thyroxine blood tests. Women who are experiencing symptoms of the disease should also go for these tests. Where necessary, other thyroid blood tests should also be considered. A woman is at a high risk if she has a history of thyroid disease or thyroid autoimmunity, family history of thyroid disease, type 1 diabetes mellitus or other autoimmune condition. Anyone with these risk factors should be sure to tell their obstetrician or family physician. Ideally, women should be tested prior to becoming pregnant or as soon as they know they are pregnant. As part of my overall approach to healthy conception and pregnancy, a complete thyroid panel work-up is really the best place to start. You can request a thyroid panel from your doctor’s office. You want your doctor to test all of the serum (blood) markers pertinent to the thyroid. The thyroid panel is especially helpful in understanding health impacts of hypothyroidism, Hashimoto’s, autoimmune disease, blood sugar control and cholesterol levels. Other nutritional deficiencies could also be identified. I will explain more about that in a minute. But, listen, you don’t have to know what each of the test names/acronyms below mean – this list is widely recognized by health care practitioners and standard labs. So, feel free to print this list off and take it in to your doctor’s office if you are requesting labs. If you are being treated for hypothyroidism, it’s imperative to have at least a TSH level checked as soon as your pregnancy is detected. The TSH level results will indicate what adjustments have to be made to your medication levels. TSH levels may be checked one to two weeks after the initial dose adjustment to be sure it’s normalizing. Once the TSH levels drop, less frequent check-ups are necessary during your pregnancy. Although thyroid hormone requirements are likely to increase throughout the pregnancy, they tend to eventually stabilize by mid-pregnancy. Levothyroxine/Synthroid and desiccated thyroid hormone (such as Armor) medication is safe for use during pregnancy. I suggest that for best absorption of the medication, you ought to take your thyroid hormone pills at least one-half hour to one hour before eating breakfast. If you are consuming iron-containing prenatal vitamins and calcium supplements, be sure you take your thyroid medication at least one-half hour to one hour beforehand. In addition, nutritional counseling to help lower antibody levels is ideal prior to conception to help support both the mother and baby’s health. Ok, this is where we get in to the stuff that I really love about holistic nutrition! Alert: Nerdy Movie Reference Here. Do you remember that 80s movie “Inner Space” with Dennis Quaid, Meg Ryan and Martin Short? You know how they miniaturize themselves so they can travel around inside a person’s body? And at one point, Dennis Quaid’s character is traveling in his mini space capsule through Meg Ryan’s body and he discovers she is pregnant! It’s so cool! Well, it would be amazing if I could go exploring inside a body to determine what each individual needs as far as nutrients. But, I can’t (and that might be weird). So, the next best thing is the Spectracell Micronutrient test. This test analyzes 32 nutrients and metabolites of nutrients which are critical to you and your baby’s optimal health. The test is not diagnostic, but rather predictive and preventative. This means if we correct deficiencies today, health problems related to Hashimoto’s (including miscarriage) are less likely in the future. I love to use the Spectracell Micronutrient test to assess each woman’s individual nutrient needs. This test makes clear your deficiencies, borderline nutrients, nutritional patterns and possible disease correlations. This information can help you to understand exactly what your body needs in terms of foods and vitamins. The nutrients we replenish thoughtfully will likely improve your Hashimoto’s, restore your health and support a healthy, full-term pregnancy. Another very cool pre-conception test is the Food Inflammation Test (FIT test). This test measures 132 edible compounds and determines if your body is reacting in a negative way to those foods and chemicals. WHY IS THIS SO IMPORTANT? If you know your immune and digestive system’s negative reaction to specific foods, it’s easier to avoid them. You will hear me say more than once that “all health begins in the gut.” So, starting with the gut is a great idea. Inflammation from food reactions shows up in a variety of ways. This includes digestive, skin, sleep, mood, malnutrition and immune system disorders. Managing inflammation is a key factor in reproductive system healing. The FIT test detects both Immunoglobulin G (IgG) antibodies and complement antigens. This will determine your reactivity to 132 foods, colorings and additives. The IgG and antigen methods yield more complete profiles of the various foods that may cause food sensitivities. The FIT test is the most sensitive food inflammation test available. The information we glean from this test helps us assess your gut and immune health. And this can steer us in the right direction for making concrete and effective changes to your nutrition plan. If you have a diagnosis of Hashimoto’s or another autoimmune disease but with few complaints or symptoms, you will still benefit from FIT testing. The results gives clarity into what level of support is needed to enhance your health and vitality through foods. I get it. This part is sometimes easier said than done: make sure to eat a balanced diet everyday! Sometimes, in early pregnancy, all you want to eat is potato chips or curry. Or chocolate bars. But, balance is such an important piece of the nutritional puzzle when it comes to supporting healthy moms-to-be and beautiful new babies. Below is a list of macronutrient categories to focus on when you are trying to become pregnant. These suggestions are appropriate for anyone, not just those with Hashimoto’s. Fats are necessary to produce hormones. Fats are not the enemy, they provide essential vitamins (such as vitamin A) not found anywhere else. We also need to eat a variety of fats – fats from animals, plants, nuts, etc. Focus on clean fats from clean animals and coconut, olive, flax and fish oils. Proteins are needed for every function of the body. For this healthy conception and pregnancy food plan we will need to eat 70-100 grams of protein a day. This can be a combination of meats, fish, dairy (raw), eggs (the best), protein powders (rarely), vegetables, beans and nuts. Carbs are a misjudged villain. The types of carbs we are talking about which support healthy pregnancies are whole grains that are in their natural state, un-messed-around-with by manufacturing and processing and contain all their original nutrients. Also, when you sprout a grain the protein content increases. Sprouting makes the grains easier to digest, causes less inflammation in the body. Fruits and vegetables supply the body with minerals, vitamins, enzymes, antioxidants, fiber and water. Oh, and the magic! The magic of food is in veggies and fruits: color, flavor, freshness, texture and aroma. You should eat a rainbow of fresh fruits and veggies to get all of the different nutrients you and your baby need. vitamin D, sources: alfalfa, raw dairy products, salmon, mushrooms, sunshine! The most important thing to know about vitamins and minerals is that they are best absorbed and utilized by your body when taken in food form rather than pill or supplement form. Also, it is possible to overuse certain vitamin supplements, creating a dietary situation that is actually more harmful than helpful. One exception to this rule is folate. There is a strong correlation between folate deficiency and neural birth defects. So, it should be supplemented by pill (approximately 800 mcg per day) in addition to food sources. I prefer the “methylfolate” form of this vitamin because of its superior absorbability. In general, I recommend a whole-food based prenatal nutrition supplement during pregnancy. It should contain the appropriate amount of vitamins, minerals and essential fatty acids for a healthy mom and baby. What Does an Ideal Pregnancy Diet to Prevent Miscarriage Really Look Like? Or raw cheese, yogurt, kefir and always choose organic. You can drink it with a meal or use it in your morning smoothies. Most people who are lactose intolerant can drink raw milk because it has live enzymes intact. If you are unable to get raw milk, or not much into it, skip dairy milk all together. New to raw milk? Learn more! You can use rice, coconut, flax or almond milk if you need a “milk” for tea. It’s best not to drink soy milk. Processed soy has so many problems such as GMOs and estrogenic effects. It can also cause endocrine disruption for the unborn baby. Pasture-raised eggs are one of the best sources of digestible proteins. Cook them any way you like them or add the raw yolks raw to a smoothie. Seafood supplies vital essential fatty acids that are not produced by our bodies. Make sure to eat wild-caught salmon only. Avoid all large, high mercury fish such as tuna, mackerel and shark. Broths are really easy to make and supply calcium, minerals, protein and immune system boosters. You can make stocks in a crock pot using the bones from chickens, fish or beef. Add water, vegetables and a splash of apple cider vinegar and cook on low in the crock for 12 hours or more. Check out my favorite bone broth (Kettle & Fire) on my Resources page. This essential fat supplies lauric acid, which boosts the immune system and is necessary for important functions in the body, such as assimilating vitamins. Avocados are an excellent “healthy fat.” Add them to a sandwich or salad for another opportunity to get some more essential fatty acids into the diet. Fermented foods provide our bodies with good bacteria to aid in digestion and immunity. They are cheap and easy to make. Eat with a meal to aid digestion. Grass fed meats provide protein, and essential fatty acids. Grass fed beef and lamb have more beneficial essential fatty acids (EFAs) in them than their conventional counterparts. Grass fed beef are active and eat grass (instead of grains). They are low in cholesterol and can have the same amounts of healthy EFA’s as fish. We get our clean, healthy, grass fed meat from ButcherBox. You can find more information about this company on my Resources page. Eat a wide range of organic, fresh fruits that are in season. Fruits supply your antioxidants, vitamins and enzymes. You can make a smoothie in the morning with lots of fruit in it. Fresh fruit/veggie smoothies will give you many of the essential vitamins for your day. Eating one salad a day and a dark green vegetable with dinner is a great start to getting plenty of vegetables in your diet. Lightly steaming or eating your vegetables raw is ideal. Add some grass fed organic butter and they will taste really good. Butter also helps nutrient absorption. Sprouted grains are easier to digest and have more protein than regular grains. Focus on greens and herbs in your fresh juice. You can make your own at home, or buy occasionally from juice stores in the area. I love the Hurom juicer and use it every week! Fresh juice is the easiest way to get your daily veggies and one of the best habits you can have for the long run. So, remember, I had three miscarriages. All were early in pregnancy, and all were likely due to the complications of Hashimoto’s disease. While my husband and I were starting our family, I was in nutrition school. And I learned all the ways in which the right foods could help heal my condition. Thankfully, I was my own best guinea pig. During my advanced studies to become an Master Nutrition Therapist, I researched on anti-inflammatory nutritional protocols. These protocols could improve or reverse autoimmune disease, including Hashimoto’s. 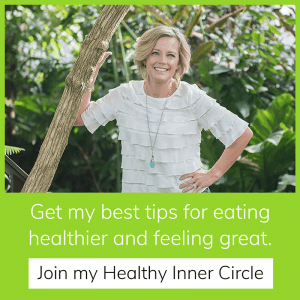 I applied core nutrition principles to my own life and I healed (reversed!) my autoimmune diseases. It sounded like a miracle to some! But I knew Hashimoto’s was reversible through changing diet and lifestyle habits and balancing the immune system. Exactly one month after my third miscarriage I took a pregnancy test and it was positive! We actually were not even trying yet, but Molly had other plans. I texted my husband who was on the golf course with my Dad. Neither of us could believe it! The outcome to this story? My two amazing kids – Clay who is now 10, and Molly, 8. They are great kids. And, I am so lucky to be their mom. And, so lucky to have found nutrition when I did. I talk about these personal experiences all the time. And I want people to have the same hope and belief in the body’s ability to heal with the right tools in place. I want couples to know that they will be able to start a family. And that their bodies will be the healthiest they can be thanks to nutrition as their foundation. I was successful in starting a family with Hashimoto’s – you can be too. Need guidance for a successful pregnancy? So, if you read this whole post and some lightbulbs are going off for you…good. You have so much more knowledge now than you did earlier. You can manage your Hashimoto’s and have a successful pregnancy. You can share all of this information with your health care provider. Inform them of your choice to implement as many of these nutritional protocols as possible. And, request the tests which will guide your health decisions. I offer programs which can help ease the transition and guide you to success. The Fertility Focus program is the best place to start if you and your partner are ready to take the leap and try for a baby. If you have Hashimoto’s and are already pregnant, either the Adult Advanced program or the Personalized Pregnancy program will be a good fit. Change is underway for you and your future family. And it all starts with pre-conception nutrition planning.